Phunaka Golf Course is a 9 hole course designed to accommodate players of all abilities. Including a fantastic 300 yard driving range with 56 bays its perfect from advanced players looking to sharpen up there game too beginners looking for some practice. The course has floodlighting for nighttime play and boasts excellent restaurants and full clubhouse. Surrounded by lush green landscapes it consists of 6 par-3’s and 3 par-4’s so you get a chance to use all the clubs in your bag. Why You Should Play Phunaka Golf Course and Academy? 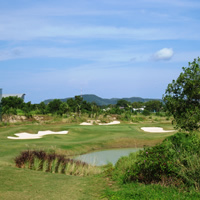 Only 20 minutes from Patong its a great place to getaway for either some practice on the driving range or a quick 9-hole game. Day or Night.